I love when a momma knows what she wants! This momma and I had a joke running – she wanted good weather, lots of orange trees, good hair, behaving kids, and a beautiful sunset. We rearranged a bunch of times but man was it worth it! We ended up with an amazing night, great orange trees, kids that looked adorable, and of course – beautiful light. She got exactly what she wanted and more! As part of every session we go through a pre-session consultation. There are a few goals of the pre-session consultations. First, getting to know you. 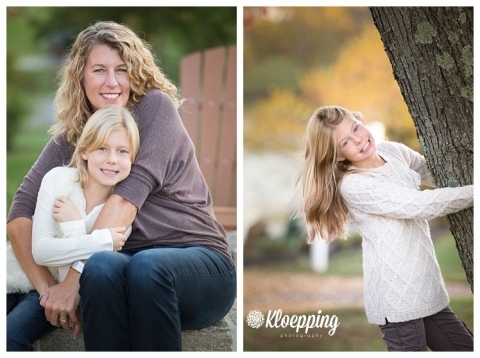 When a client is new to Kloepping Photography, I like to sit down and get to know you and your family. Because I strive to make each session reflect the personality of your family I like to get to know them first. Second, we talk about your intent for the images and where you think you may use them. It’s so easy these days to just take the digital files and run. What often times happens is that they never leave that USB drive. While I’m happy to provide digital files, I do so in combination with other printed art. Third, we talk about the design of the session. We talk color themes, what to wear, and how to prepare. For this family we spent a bunch of time focusing on what to wear. This momma loves fall! She wanted the fall colors to really shine and thus didn’t want to compete too much with their outfits. We went through a bunch of different iterations (I like to use Olio board to show outfits. See some examples here 1, 2, 3, 4, 5) before settling on what we ended up with. They were perfect! And lastly we walk through the process. What to expect before, during, and after. We spend some time looking at and talking about some of the products and collections that I offer. I hope is that by spending this time up front you know exactly what’s happening and what’s coming and are at ease with the whole process. Once we get past the pre-session consultation it session time. This momma was sure we’d struggle but I told her that if she relaxes, the rest of the crew would too (and since they weren’t driving, a glass of wine never hurt anyone:) ). The session went off splendidly. I could barely wait to get home to get the photos off the camera to start working on them. If you’re interested in booking a family session with me click here for my request form! !